This repeated pink number from Mary is fine, but I'll never fall in love with it if I can't get past the hairdo. Harsh center parts with hair plastered to the head on either side are just not a flattering affair, and this one is calling to mind another major 'do I didn't care for: her wedding hair. This is a tad Carmen Miranda, minus the fruit hat, no? Nevertheless, she gets an award because she wore a tiara: that's the Sayn-Wittgenstein-Berleburg fringe around her neck. Extra sparkly, just as a mother of the bride should be. You know how I love the sparkle and the shine, but it doesn't always go well. Carina's just sort of...there. And Alexandra is almost not there, she's so washed out by her beige gown. Tatiana, on the other hand, is probably more there than she should be: that's some dress. It's like something rejected from Tina Turner's closet, thrown out for covering the legs too much. None quite matches Alexia's sequined game, though. So sad she decided to repeat the sack she wore to Victoria and Daniel's wedding. So, so sad. So chic it hurts, M-C is. 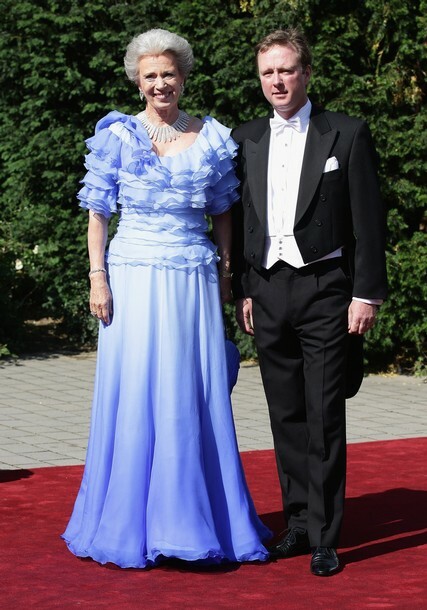 Regal royal blue, appropriate but flattering. 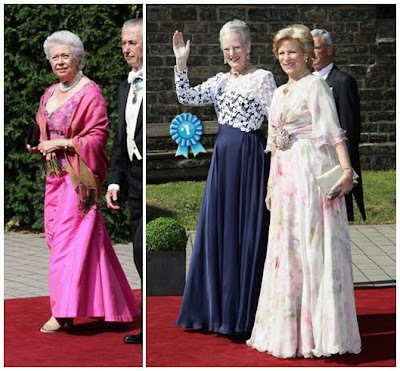 And those clips stuck on the side are just the cherry on top: infinitely more fashionable than a regular old brooch, but still bringing the royal bling. Best dressed of the day, by far. Last but not least: the bride. In a gown that is...interesting. 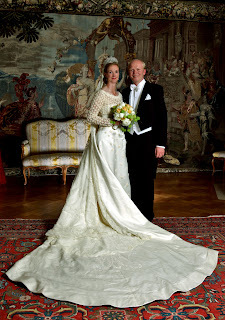 This is a creation from Danish designer Henrik Hviid and is made of heavy ivory satin with a silk organza lining. 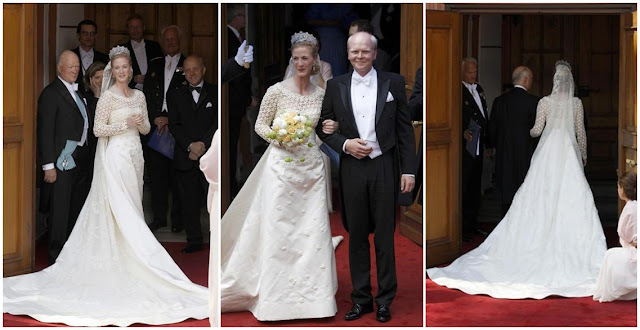 The top is lace, the waist is cinched with a pleated satin belt, and the train is three meters long and two meters wide with the monogram of the bridal couple embroidered in pearls and crystals at the bottom. Princess Nathalie carried on all the appropriate Danish royal family traditions: she wore the same lace veil and Khedive of Egypt tiara as the rest of the women in the family have done (a bit more history on those traditions can be found here). 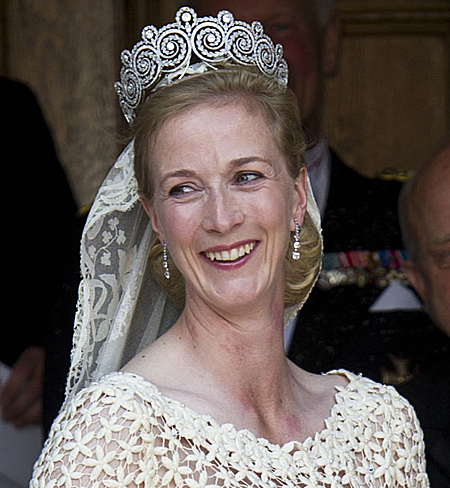 This is one of the best outings of this veil we've seen, but I'm not so sure about the tiara. I can't much stand visible tiara bases, though I may possibly be in love with the floating crown effect she's created. Definitely looks much bigger on Nathalie than it has on anyone else! First impression? Well, I may have called the dress "homely" on Twitter. (I'm mean. Though to be clear, I was only talking about the dress, not our dear bride.) It's almost more of a crochet top than a lace one, the pattern's so big. 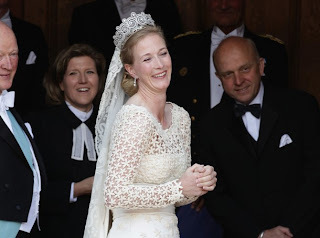 And the scattered baubles over the front seem like a last-ditch effort to tie the lace in. But now that I've thought about it for a while, here's what I've come up with: it's not like Nathalie's a terribly traditional bridal type in the first place. She's an Olympic medalist and star equestrian, like the Zara Phillips of the Danish royal family. (Read: would rather be in the stables.) And she and Alexander aren't exactly a traditional couple; they were civilly married last year because Nathalie was pregnant, and now have a son named Konstantin. She's more the kind of bride that forgets her bouquet (as she did, having to wait 7 minutes at the door to the church while it was brought to her). So with all things considered, while I'm still not a fan, I'm giving her the most important bridal award of all: biggest smile. Giant lace and all, that's still the stand out feature. 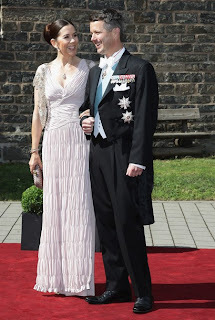 Who was your best dressed at Nathalie's wedding? 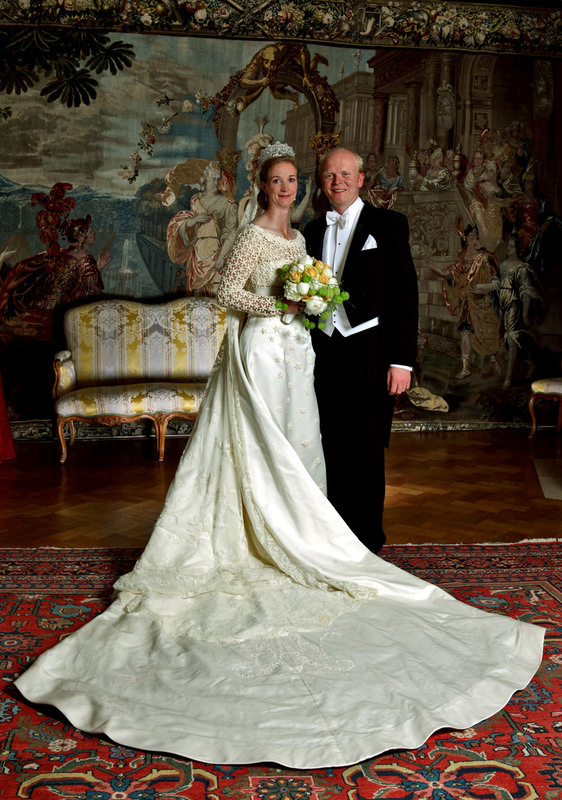 And what did you make of the bridal gown?